3…2…1…lift off! Smoke billows out, forming massive clouds that envelop the launch pad as the rocket rises upward to begin its journey to the stars. Onlookers shield their eyes from the bright glow of the flames propelling the rocket through the atmosphere. Loaded with fuel, energy, life support, and food supplies, the crew is ready to complete their missions up in space. The race to explore space is in full swing in Lift Off! With new technological advancements, astronauts can thrive in space and explore the cosmos. As the head of a fledgling space agency, it’s your job to develop technologies and upgrade rockets to launch even more ambitious missions, assuring your place in history. 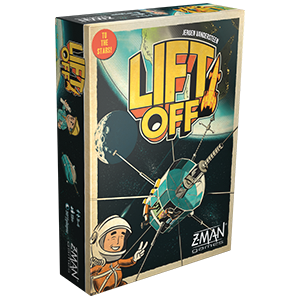 Pre-order your copy of Lift Off through our website or your local retailer today to enjoy this retro resource management game. Humanity yearns for the stars. Now is your chance to claim your spot in history and explore the cosmos! 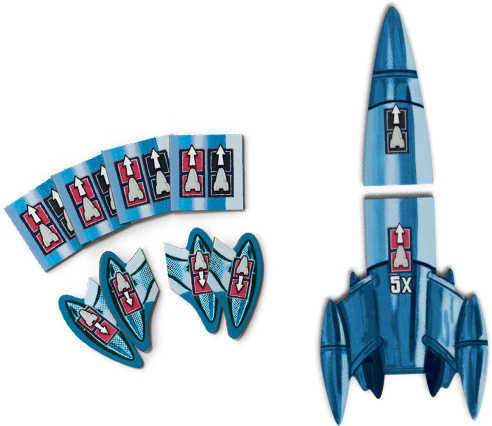 Starting with a simple lab and a basic rocket, you must prove your skill and race to complete missions in space. In order to complete missions, you’ll need the right technology. Missions will vary in complexity from level 1 to level 4, each with different technological requirements. To prepare for missions you’ll need to develop technologies: fuel (red), food (green), life support (blue), and energy (yellow). 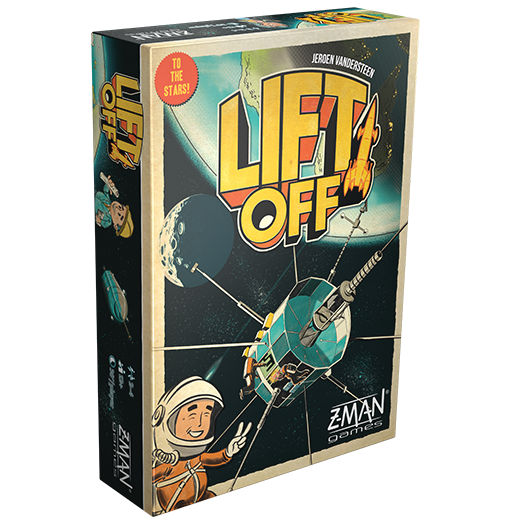 In each round of Lift Off, players will draw and select missions. You could send up the first satellite, mine minerals from asteroids, build an orbital trading post, or land on a new planet. There are many different options to explore. Mission plans will start on Earth before they can be launched up into space and successfully completed. As your space agency grows, you can tackle missions with a higher level of difficulty. A more complex mission will have a bigger payoff for your agency but will require more work; it could need more technology or an upgraded rocket or both to successfully complete it. Some missions will give you immediate effects (awarding victory points, advancing your income track, giving you new technology, and more), while other missions will have effects applied during the end of the game. 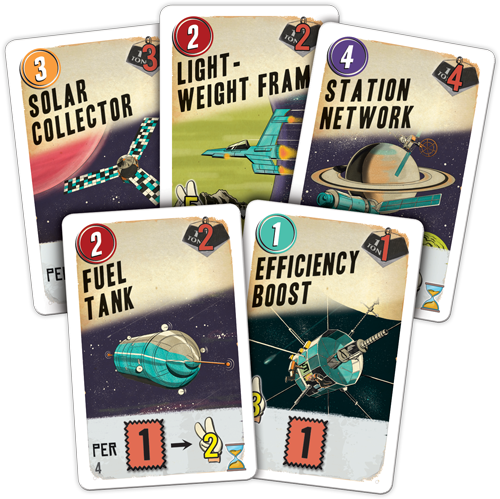 For example, the efficiency boost mission will give you 3 victory points and one red technology card right away, but the fuel tank mission will give you 2 victory points for each of your red technology cards during the final scoring at the end of the game. When preparing to launch a mission from Earth to space you must check the requirements on the card. 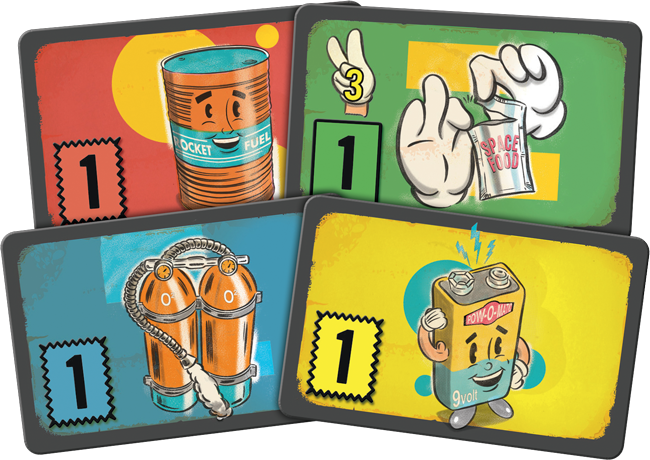 The top left corner of the card identifies the level of the mission and must be less than or equal to your lab level. 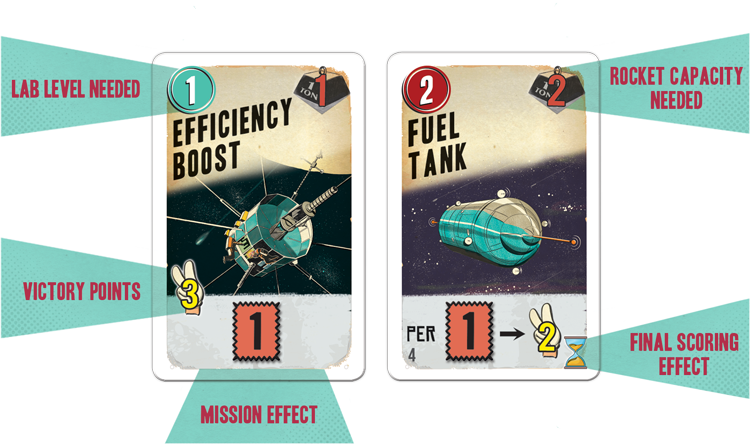 The top right of the card shows the rocket capacity you’ll need to successfully carry up the cargo. Each space agency has their own basic rocket ready to enact their mission plans and launch into space. To complete the more ambitious missions you’ll need to upgrade your rocket to carry larger loads of cargo and fly more efficiently. Getting up into space isn’t cheap, so you must carefully manage your agency’s funds. Each time you launch your rocket, you’ll have to pay for the fuel to get up to space. Propulsion upgrades can help boost your rocket, making it more efficient and decreasing the cost to launch. Capacity upgrades can increase your cargo space, allowing you to take up larger parts for bigger missions such as building a satellite network, but all that added weight makes the rocket more expensive to launch. Carefully balancing cargo space and propulsion is a must to succeed in completing your missions! By strategically selecting your missions, carefully managing your funds, and utilizing talented specialists, you can explore the cosmos and win the race to the stars! Stay tuned for our next article covering the specialists you can hire to assist your space agency and make sure to pre-order Lift Off to claim your copy and prepare to launch to the stars.